Hello Gears fans! If you’re reading this, you likely just finished watching the incredible Xbox E3 stage presentation, revealing the Xbox One X arriving November 7th 2017. As you may have spotted, Gears of War 4 made some sneak appearances in plenty of the videos showcasing the graphical capabilities of Xbox One X - and we’re excited to announce that we’ll be releasing a free update to Gears of War 4 at launch to take full advantage of the power of Xbox One X! We’re at E3 showing a live demo to attending press and fans from around the world. To bring a little of that experience home for all of our fans, I sat down with Mike Rayner (Technical Director, The Coalition) to talk about what to expect from Gears of War 4 running on Xbox One X! If you'd like to see a briefer version of this talk in video form, click the video above to see Rod Fergusson and Mike Rayner discuss bringing Gears of War 4 to Xbox One X.
Octus: Hi Mike! As a Technical Director, working on the most powerful console ever made must be an extremely exciting prospect. How are you feeling about today’s announcement? Mike Rayner: We’ve been working with the Xbox One X for some time now, and we’re incredibly excited to see it come to life as something gamers can take home this November. Gears has always been known for being a graphical leader on consoles – and now on Windows 10 PC – so having an incredibly powerful piece of hardware in the console space that we can really push ourselves with is a dream come true. Octus: I’ll join you on the excitement! 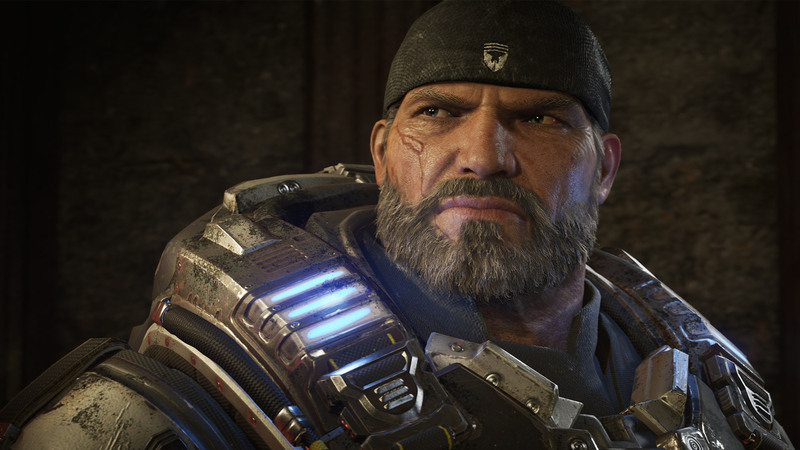 What can we expect from Gears of War 4 running on Xbox One X? Mike Rayner: The first and probably most noticeable improvement is, of course, that we render the game at native 4K resolution. Not only does that mean a 4x increase in our native rendering resolution compared to 1080p on Xbox One, but it also means much higher resolution textures across the board – from characters to environments, visual effects, everything! Bringing that incredible level fidelity to the console for the first time, which so far has really been limited to top-spec PC rigs, has been incredibly exciting for us. One of the exclusive features for Gears of War 4 on Xbox One X is the ability to run 4K HDR with Wide Color Gamut Support. We supported HDR on the Xbox One S, and 4K on PC, but this is the first time you can play Gears of War 4 with a combination of that incredible 4K fidelity and the vibrant contrast of HDR. It’s really something else. Octus: Honestly, I may have died a few times defending the Outsider Village because I was too busy gawping at the visuals! What else is going on from a technical perspective that makes it look so good? Mike Rayner: I guess that means we’re doing our job well! We’ve worked on bringing a number of additional technical improvements that really bring our world to life more than ever before that are exclusive to Xbox One X. We have fully dynamic shadows now – so for example, if a tree is blowing in the wind, on the ground you’ll see that shadow of that tree dynamically move as you’d expect it to. We’ve also enhanced the detail in these shadows so they’ll look crisper and more detailed. The new Shadow improvements really add a lot to the feel of our environments. One of the things you were probably gawping at (while you were busy dying, let’s not forget) in the Outsider Village are our real time light shafts – sometimes referred to as ‘God Rays’. You’ll now see shafts of sunlight or moonlight poking through statues, moving helicopter blades, the branches of trees and so on as they would in real life. It’s one of my personal favorite features because it’s just so visually eye catching and atmospheric. We also have other features like improved reflections, longer draw distances and higher poly counts to further bump up the fidelity of our world. Octus: Thanks for reminding everyone I died there, Mike. We’ve talked about the visual improvements bringing us into the world more than ever before – how are we doing that with audio? Mike Rayner: One of the unique features of Xbox One X is full support for Dolby Atmos 7.1.4 audio – for both headphones as well as Atmos Digital Receivers. Dolby Atmos adds extra channels that are used for ambient audio experiences, adding environmental noises that encapsulate you as if you were right in the midst of the action. On the dramatic side, the sound of Kestrel helicopters right above you and missiles flying overhead really add to the intensity of the firefight. When you go through the darker opening moments of Act 2 with nothing around in the dead of the night, the sounds of the wind and leaves rustling around you reinforce that feeling of being on your own against an unknown emergent enemy. It’s an added layer of, well, atmosphere that elevates the experience whether you are fighting online or journeying through the story of our game. Octus: What does this update mean if I’m planning to upgrade to Xbox One X, but I don’t own a 4K TV just yet? Mike Rayner: You’ll still get all the benefits of our Xbox One X update that really elevate the visuals of the game – that means the higher resolution textures, the fully dynamic shadows, improved reflections and so on are all there even if you’re outputting to a 1080p TV. When it comes to resolution, we always super sample from 4K down to the resolution output of your device. For those of you who don’t know, super sampling is when the native rendering of the game is above the resolution of our TV and the signal is scaled down to the output resolution of your TV. This produces a sharper picture with increased anti-aliasing that, while not as crisp as 4K, looks markedly more detailed than even a native 1080p signal would produce. Octus: Are there any changes to framerate on Xbox One X? 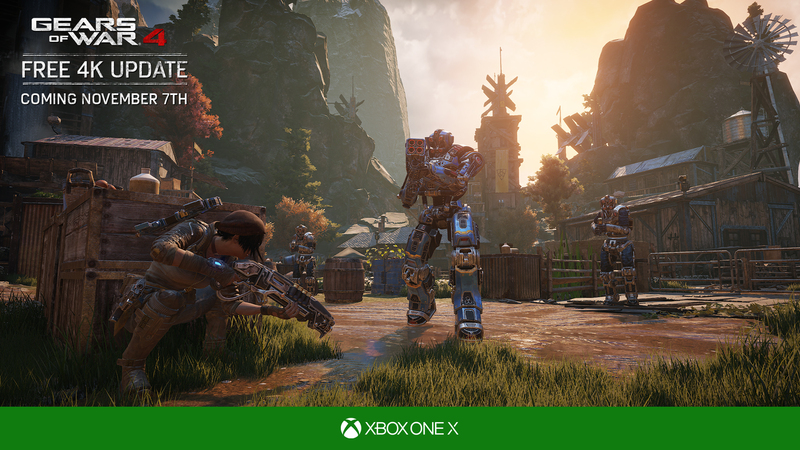 Mike Rayner: Our team have set out to really push what we can achieve at a native 4K resolution while maintaining a rock solid framerate – and all in time for our Day One Update so fans can experience Gears of War 4 running with the power of Xbox One X on release day. With that being our focus, we’re running at 4K 30FPS for Campaign/Horde and 4K 60FPS for Versus with adaptive scaling to ensure a rock-solid frame rate that fans expect from our head to head multiplayer. 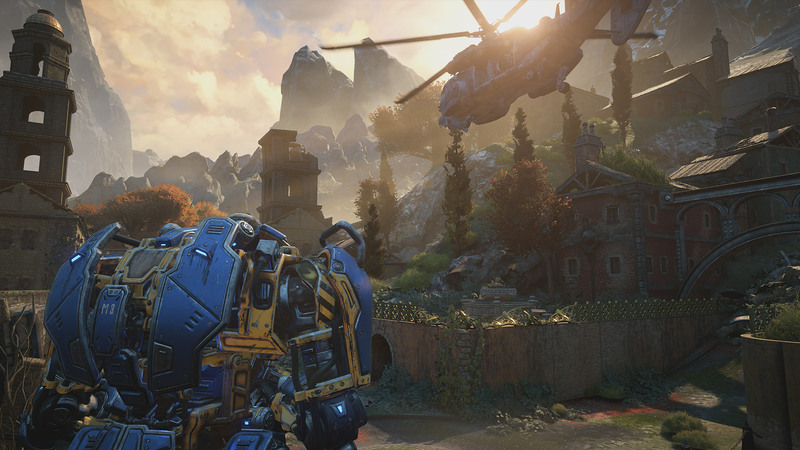 Many of the improvements to Campaign also make it to Versus and Horde, including 4K, HDR, higher resolution textures, improved draw distances, and Dolby Atmos Support. Octus: Thanks for all this info Mike! Any last words you have for the fans out there? Mike Rayner: I just want to say a massive thank you to all the players who’ve supported our game so far. Our team really push themselves to bring the best visual and audio experiences possible to Gears fans, and we’re really excited for fans to try Gears of War 4 running with the power of Xbox One X when they take their new console home at launch! If you’re planning on picking up Gears of War 4 to showcase your Xbox One X this year, don’t forget you can download the Game Trial of Gears of War 4 to try 10 hours of the game for free! Once you have an Xbox One X of your own, you’ll be able to update the game for free to take advantage of all these great features. We’ll be talking and showing more about Gears of War 4 on Xbox One X later this year. Stay tuned to our Facebook, Twitter and Instagram channels to be up to date with all the latest news.